ZillowAside from the lakefront home's large stone fireplace in the living room, there are fireplaces in the bedrooms. 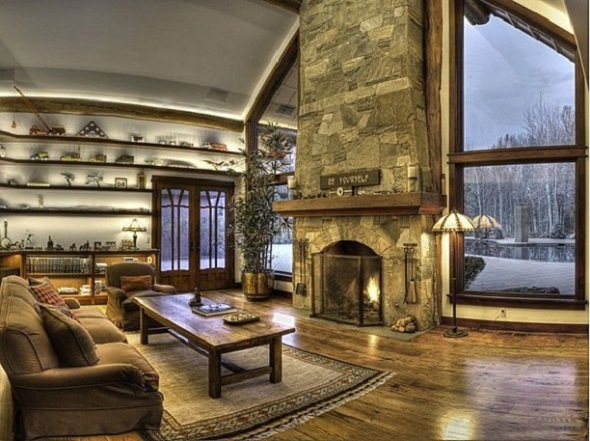 The Idaho getaway once frequented by Bruce Willis is almost half-price after another price cut. The refurbished 20-acre estate and six-bedroom, seven-bath home is for sale for $8.8 million. He first listed it in 2011 for $15 million. Willis used to own a Sun Valley bar, The Mint, and the Soldier Mountain Ski Area in the Southern Idaho hotspot. Willis listed The Mint for sale in 2010, and now reportedly spends less time in Idaho and would like to shed the 8,400-square-foot home as well. The lakefront mansion has a living room with vaulted ceilings and a large stone fireplace, plus additional fireplaces in the bedrooms, a 2,200-square-foot master suite and bath, log posts and beams and a chef's kitchen. And you never have to shovel the walk: The pavers, decks and driveway are all heated. The listing agent on the home is Janine Bear of Sun Valley Sotheby's International Realty. CORRECTION: An earlier version of this report said that Bruce Willis at one time shared this home with his then-wife Demi Moore. That information was unconfirmed.